Here's how to make a responsive system with high-performance 3-D, fast disk, lush sound and the things to keep it trouble-free. A $70 CPU may be all that you need. We take a first look at AMD's Duron, an excellent choice for midrange desktop Linux machines. Can't afford Don Marti's “Ultimate” Linux box? Well, read on...Jason outlines options for the economically challenged. Enough about us already; what do you think? Athletic flightless waterfowl? No, just the skinny on the Comdex exhibitor awards ceremony. If you work with multiple platforms, LTOOLS may offer a way to make your life a whole lot easier. The author demonstrates how easy it is to write in Python—and make sure you get steamed, not fried rice. Most of us don't take the time to place for disaster recovery. This article gives you the step-by-step. Farm those jobs out with Gnu Queue! Can't find a system that has everything you want? Build your own. 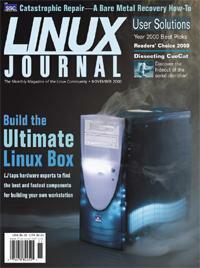 Tips and suggestions for using Linux on the desktop in a non-Linux workplace. Recent changes in the areas of both software and hardware are combining to revolutionize networking. How embedded systems have become a part of Red Hat's operations. Web composition solutions provided by ModLayout. MontaVista's announcement was not met with universal approval.